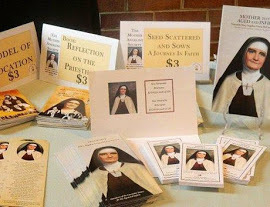 Members pray for the Cause for the beatification of Mother M. Angeline Teresa, O.Carm.,Foundress of the Carmelite Sisters for the Aged and Infirm and seek ways to promote hercharism in the Church. Two Masses offered every month of the year for all members. Special remembrances in the prayers of the Carmelite Sisters. Receive the The Mother Angeline Society Bulletin. in preparation for the Feast of Our Lady of Mount Carmel.